Privacy concerns surrounding Google Glass are growing rampant. Eight Congressmen even joined in on the conversation on Thursday, fearing that the cyborg-like technology could be too invasive. Google's response: You'll know when someone wearing Glass is being sketchy. In one of the most provocative moments of this week's Google I/O developers conference, Glass engineers fielded audience questions regarding privacy concerns. Google was clearly prepared to discuss the topic. "The process for taking a picture or video has clear social queues," explained Steve Lee, Glass' product director. "When Glass is active, the display lights up. Because of that, you can rest assured I'm not recording you." Lee was quick to point out that privacy issues surrounding Glass had been considered a top priority by his team since day one. Glass engineer Charles Mendis noted that Google's official policies for Glass app development are designed to address privacy issues. For example, Google (GOOG) forbids app developers from shutting off the display while Glass is active. But Mendis also noted that simple awareness of surroundings will play a key part in privacy. "If I want to record a video with Glass, I have to be staring at you," said Mendis. "And if you're human, you'll notice me staring at you." Of course, someone could hack Glass to disable the screen -- Google even led a how-to on hacking Glass, though the company was quick to note that hacking will void a user's warranty, and shutting off the screen was not among the discussed topics. From the sounds of it, Google would not allow such an app to be distributed through official channels. "We are thinking very carefully about how we design Glass because new technology always raises new issues," a Google spokeswoman said. "Our Glass Explorer program, which reaches people from all walks of life, will ensure that our users become active participants in shaping the future of this technology." Google's assurances haven't convinced some members of Congress, however. A bi-partisan committee on privacy sent a letter to Google this week expressing concerns about Glass. "We are curious whether this new technology could infringe on the privacy of the average American," the letter states. The eight "unanswered questions" the group posed focused mainly on data collection and protection: How will Google avoid "unintentionally collecting data" without consent, as Google admitted its Street View data-collection cars did? What type of data will Google collect? The committee also asked whether Google plans to implement facial recognition technology, and if so, whether people be able to opt-out. Google has "experimented" with facial recognition, execs said at I/O on Thursday, but that isn't in the company's current plan for Glass. Still, Google stopped short of saying it's not in future plans. Despite lawmakers and pundits' concerns, intrigue related to Glass made the technology the clear star of this year's I/O conference. Nearly every discussion dedicated to the headset saw serpentine lines of attendees trying to cram their way into packed conference rooms. Public paranoia wasn't the only focus. Some attendees talked with excitement about Glass' possibility, while others, including Google's own employees, said they wouldn't be caught dead wearing Glass. Google also announced seven new apps for the emerging technology, which include custom-tailored software from the like of Facebook (FB), Twitter, Tumblr, Evernote and Elle Magazine. CNN also released an app for news updates. Glass' first game even surfaced at the conference in the form of Ice Breaker, which is a scavenger hunt of sorts that takes full advantage of the on-board technology. The game requires you to use Glass to find another Glass user, snap a picture with that person, and earn points for doing so. It's a little dumb, a little pointless, but undeniably fun. Although these big-name apps provide immediate, tangible examples of how Glass can be used, smaller developers showed off many of their innovations as well. 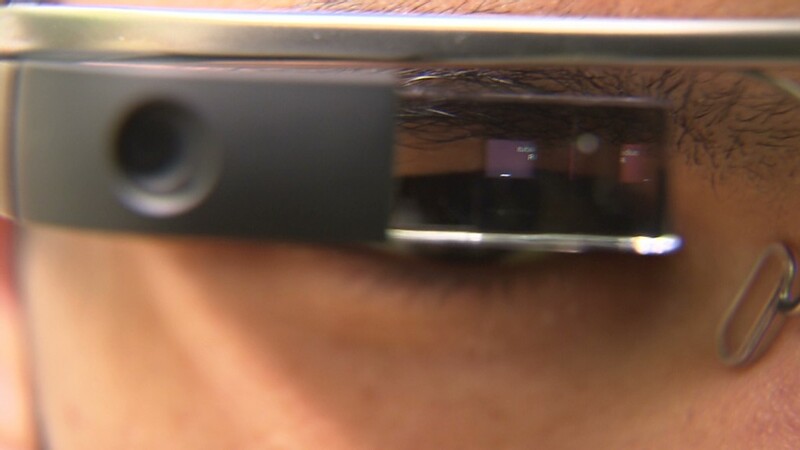 Google says that Glass remains a test-bed for software developers and an unfinished product. By the time Glass is ready for prime time, it's a safe bet Google will make some changes with privacy in mind.